After escaping, Bù Huàn happens upon Cán Yún and Fěi. He learns Yún Xiāo and Hài stole the crossguard and intend to sell it to Tiān Hái. Suddenly, Diāo Mìng and the Xuán Guǐ Zōng show up and attack the three of them. 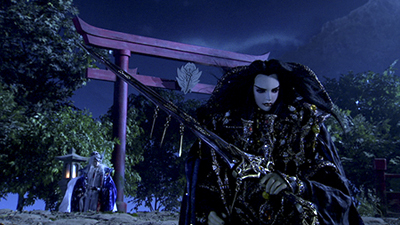 Bù Huàn shows his true colors and fights with a wooden branch. After killing Diāo Mìng and the Xuán Guǐ Zōng, Bù Huàn explains his philosophy as the three of them head to the Duàn Jiàn Cí. Meanwhile, Yún Xiāo and Hài meet with Tiān Hái at the Duàn Jiàn Cí. After removing the sword from the pedestal, Yāo Tú Lí is revealed, the lost demon god. Hài then kills Yún Xiāo for trying to prevent the awakening of the demon god. Xuě Yā confronts Tiān Hái outside the Duàn Jiàn Cí after Hài leaves.